The Flex-Hone® Tool is a perfect solution for many of your finishing, deburring and edge-bending needs. Available in a variety of sizes and abrasive types, our honing tools use a flexible honing process to provide superior surface finish on any base material. Our flex hones are unlike any other honing tool because it produces an unmatched controlled surface condition. 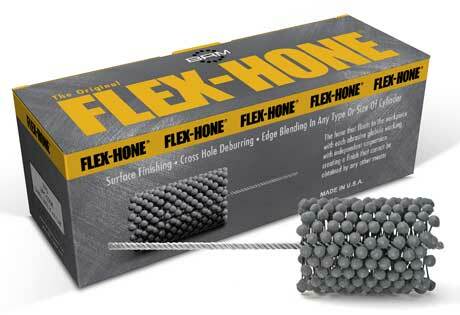 The Flex-Hone® Tool is available in a variety of abrasive types and grit selections to provide the optimum surface finish on any base material. The Flex-Hone®, also known as the cylinder ball hone, is commonly used to reduce Ra, Rk and Rpk values while maintaining Rvk and Vo volume for oil retention. Using the Flex- Hone® Tool for surface finishing allows the sizing tools to do their jobs quickly and accurately without fighting surface finish. The Flex-Hone® is also used in adhesive bonding applications where a rougher surface is desired for bonding integrity. Deburring of cross drilled holes is an expensive, time consuming operation. The Flex-Hone® Tool can be used to remove burrs from cross drilled holes leaving a clean, radiused intersection. Because of its unique construction, the Flex-Hone® can be used online in machine tool applications or offline as a secondary operation. The cylinder honing tool is self-centering and self-aligning to the bore so elaborate, rigid set-ups are not required. It is advisable to use the tool in the main bore into which the cross holes break. Best results are obtained by rotating and stroking the flex hone a few strokes in a clockwise direction, removing the tool from the part, reversing the spindle and then rotating and stroking the tool in a counter clockwise direction for a few more strokes. This forward and reverse rotation creates a more symmetrical deburring pattern. Brush Research pioneered the concept of a plateau finish and is a strong proponent of the benefits of a cross hatch, plateaued finish. The concept involves using flex hones to remove the peaks produced by prior machining operations to create a substantially flat or plateau finish. A plateau finish created by the elimination of peaks allows rings and seals to seat without damaging their edges. The cross hatch pattern will aid in lubrication control and retention, reduce seepage in hydraulic and pneumatic applications and promote longer seal life.